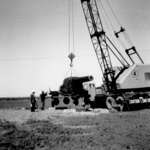 A black and white photograph of the placing of the north cannon at the new Courthouse at 605 Rossland Road East. The Courthouse cannons were transferred to the Ontario County Courthouse at 416 Centre Street South from the Citadel in Halifax, in 1902. On June 16, 1964, they were moved to the new Courthouse at 605 Rossland Road East. 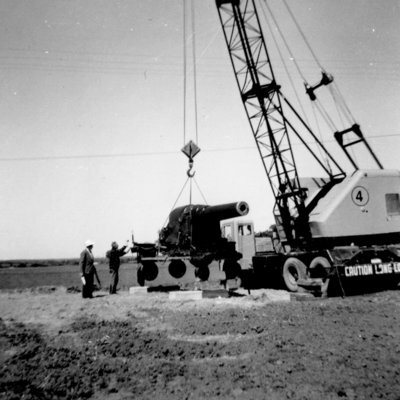 On July 8, 1989, the cannons were returned to the Citadel as part of a restoration program. 605 Rossland Road East, June 16, 1964, Brian Winter. Whitby Archives A2013_004_013.